Mamshit was a Nabatean/Roman/Byzantine settlement that lay along the 1,500 mi. long Incense Route that ran from Yemen to Gaza. It was constructed in the first century AD by the Nabateans and served as a fort/caravansary. Camel caravans from Yemen would typically make their way to the Aqaba/Petra regions and then follow the Rift Valley north to Tamar. 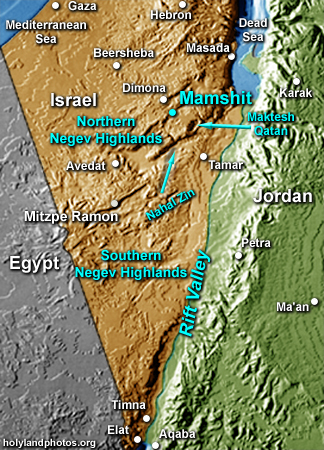 From there they would ascend the rock escarpment just to the south of Maktesh Qatan to Mamshit, and from there proceed to Gaza—where frankincense and myrrh would be loaded on to ships. 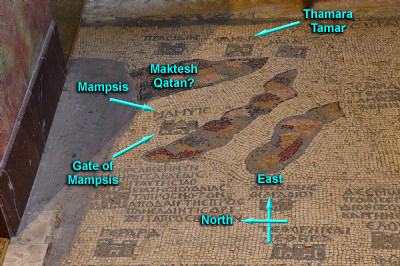 Mamshit is the supposed Semitic version of the Greek Mampsis. In Arabic the site was/is known as Kurnub. It ceased to exists sometime in the seventh century AD.